In addition to our residential door and window services, Ace Door & Window also offers window and door installations and replacements to Jacksonville businesses. Years of wear-and-tear don't just affect your home, but they also lead to the outdating of the commercial doors and windows of your business. Just as accidents cannot be accounted for at home, neither can they be planned for in the workplace. Whether you need to install a commercial door system to replace your outdated system, or need to replace a broken storefront window with a new commercial window, Ace Door & Window has the tools and experience to handle your commercial job. Storefront Doors—These doors are ideal for enclosed shopping malls. Storefront doors allow your business to maximize the window space that prospective shoppers see. For retailers, this is a very beneficial commercial door solution. These doors can also be used for institutional sliding doors, sliding room dividers and inner pocket doors. 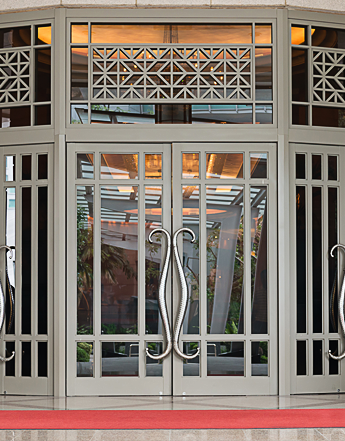 Metal Doors—These doors are essential to many commercial properties. We offer a complete line of metal doors in Jacksonville, featuring standard doors, as well as specialty hollow doors. All of these commercial doors are made from quality steel and phosphatized, offering you excellent paint adhesion and high corrosion resistance. The same premier window services that are offered to residential properties are also offered through our commercial window replacements for businesses in Jacksonville. Ace Door & Window installs quality commercial windows in Jacksonville that are energy efficient, high quality and designed to meet the pressures of your business. By being able to choose from materials that include aluminum, vinyl, and high wind resistant windows, we guarantee that your commercial window replacement in Jacksonville will surpass your expectations. Call Ace Door & Window at (904) 438-3981 to learn more about our commercial window replacements and commercial door replacements offered in Jacksonville, Neptune Beach, Atlantic Beach, Jacksonville Beach, Ponte Vedra Beach, Arlington and Southside Jacksonville, Florida.